I might be a little late in the game, but I'm really loving matte lipstick these days. They are long-lasting and give you the colour without the shine. Which is great, because I prefer to draw attention to my eyes instead of my puckers. But while I mostly stuck to smoky eye makeups in the past, I'm starting to discover how much glorious potential lipstick can do to your look. I mean, they're essentially lip paint. You can go nuts with them! Okay, maybe not that nuts. Unless you're Ke$ha (apparently, just Kesha now), in which case, anything goes. Anyway, matte lips: I saw a gorgeous shade of fuchsia at Sephora Singapore the other day that I snapped up immediately. 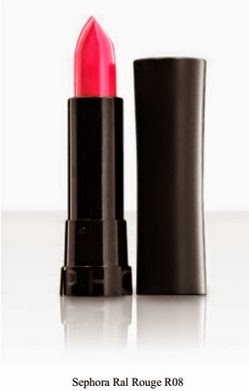 It's called the Ral Rouge R08, and is formulated with blackcurrant and olive oils to keep your lips happily moisturised. decided to make a list of 5 hot beauty trends to try this season. and yellow and orange and other bubblegum colours. Perfect for spring and summer, these pops of colour are a definite mood-lifter! My Tip: Don't just use the coloured eyeliner on its own. Use a black liquid eyeliner first (fine line) and then draw on the coloured eyeliner above it. You've seen how silver screen stunners like Lily Collins and Emma Watson, and models like Hilary Rhoda and Arizona Muse work this trend. Strong brows doesn't mean cave-woman brows, though. Don't skimp on the tweezing, but don't overdo it either. Invest in a solid pair of tweezers and you can nail this trend too. 3. Lob it off - your hair, that is. Apparently, a lot of girls are going short these days. From It models Karlie Kloss and Coco Rocha to Taylor Swift and Beyonce. But it doesn't suit everyone though! Take note of your face shape and find the style that suits you best: a chic bob or a pixie cut. If you have razor-sharp, model-worthy cheekbones like Karlie and Coco, you can go super short and still look feminine. If you have a round face, though, an asymmetrical bob might suit you better. 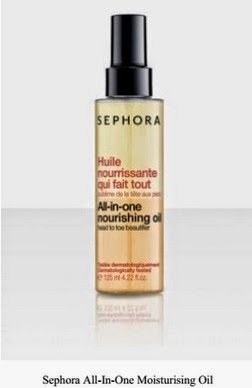 If you do decide to go short, fight the frizz with this moisturising oil from Sephora! Super lightweight and nourishing. If you've had enough of crazy, eye-popping nail art, go back to basics with single, solid tones. Just glam it up with metallic hues in silver and gold a la Rihanna you'll be all ready to hit the streets. See how it brightened up their faces immediately? I. Am. Sold. 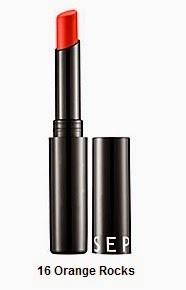 Right on trend, Sephora has orange matte lipstick too: the Colour Lip Last No. 16 Orange Rocks. Yeah, quite a mouthful. Just call it orange matte. 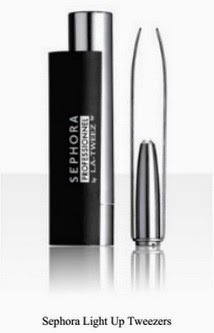 Love the range of products at Sephora, it's like make up heaven. Super pleased I can now shop Sephora online. 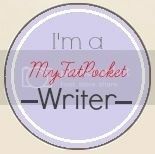 Enjoy, ladies!